BEFORE YOUR TREATMENT. We suggest that you arrive 15 minutes prior to your treatment to allow yourself time to check in, change and familiarize yourself with the spa. Arriving late will limit the time of your spa treatment, therefore lessening your pleasure. To enhance the spa experience for all our guests, we ask that voices be kept low when conversing and that cell phones be turned off. RESERVATIONS AND CANCELLATION POLICIES. Please make your reservations as far in advance as possible to ensure availability of your requested services. If you need to cancel your reservation, please notify us 24 hours prior to individual appointments and 48 hours prior to package appointments to avoid a 50% cancellation fee. Same-day cancellations and no-shows will result in a charge of full value. During days of closure, please email your notice of cancellation to appointments@raintreespa.com. WHAT TO BRING. 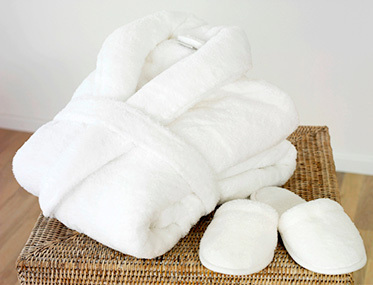 Robes, foot wear and private lockers are provided for your comfort. In addition, post-treatment personal care amenities are provided (except hair brushes). Please leave valuables at home, as Raintree is not responsible for any lost items. Please be aware that for the relaxation of all our guests, we cannot accommodate infants and children. GRATUITIES in appreciation of exceptional service, gratuities are welcomed and may be given at your discretion. Please note that if you are using a gift card to pay for your treatment, cash rather than credit card gratuities are greatly appreciated. Prices and treatment protocols subject to change without notice.